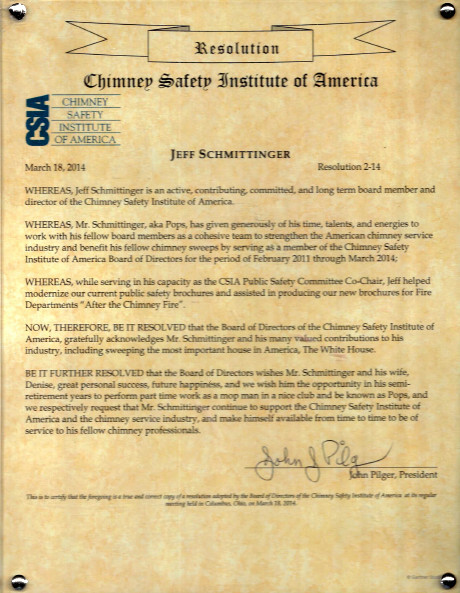 WHEREAS, Jeff Schmittinger is an active, contributing, committed, and long term board member and director of the Chimney Safety Institute of America. WHEREAS, Mr. Schmittinger, aka Pops, has given generously of his time, talents, and energies to work with his fellow board members as a cohesive team to strengthen the American chimney service industry and benefit his fellow chimney sweeps by serving as a member of the Chimney Safety Institute of America Board of Directors for the period of February 2011 through March 2014. WHEREAS, while serving in his capacity as the CSIA Public Safety Committee Co-Chair, Jeff helped modernize our current public safety brochures and assisted in producing our new brochures for Fire Departments “After the Chimney Fire”. NOW, THEREFORE, BE IT RESOLVED that the Board of Directors of the Chimney Safety Institute of America, gratefully acknowledges Mr. Schmittinger and his many valued contribution to his industry, including sweeping the most important house in America, The White House. BE IT FURTHER RESOLVED that the Board of Directors wishes Mr. Schmittinger and his wife, Denise, great personal success, future happiness, and we wish him the opportunity in his semi-retirement years to perform part time work as a mop man in a nice club and be known as Pops, and we respectively request that Mr. Schmittinger continue to support the Chimney Safety Institute of America and the chimney service industry, and make himself available from time to time to be of service to his fellow chimney professionals. This is to certify that the foregoing is a true and correct copy of a resolution adopted by the Board of Directors of the Chimney Safety Institute of America at its regular meeting held in Columbus, Ohio on March 18, 2014.